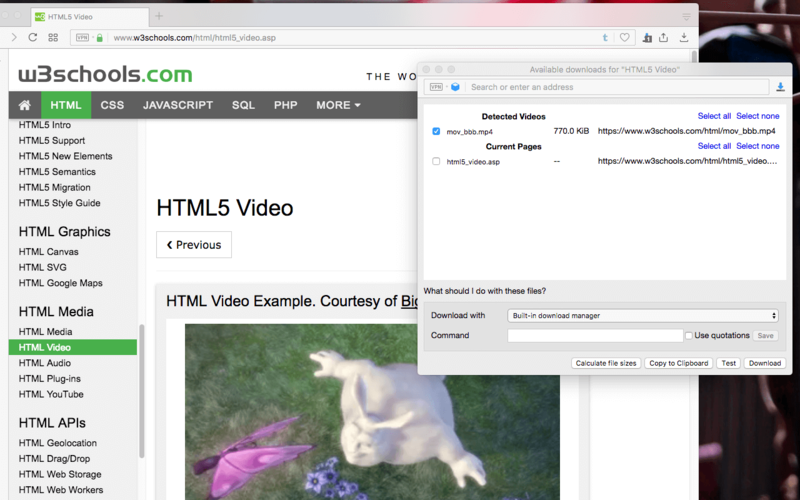 "Easy Video Downloader" is a cross-browser extension that detects media (video and audio) resources from the current page and allows to download them either using the browser's default download manager or an external download manager like Internet Download Manager (IDMan) or GNU Wget. The extension can be configured to detect image sources as well. It is also possible to interrupt the built-in download manager and send the downloading jobs to an external download manager. The total number of detected resources for the current page is displayed as a badge number for each page. This extension supports downloading a single file or multiple files at once. What can I expect from the "Easy Video Downloader" extension? This extension can be used to detect and download media and image sources from the current page and it iframes (child frames). Based on your settings, the extension installs a single observer over the network and grabs media (video and audio) and images sources when they are being requested by the web page. The total number of the grabbed sources is displayed as a badge number over the toolbar button. When the toolbar button is clicked, all the grabbed sources are listed in a download manager window. You can select sources that you prefer to download and then either use the default browser downloader or an external download manager to get these files. Note that to download these resources using an external download manager, you will need to install a minimal native client by @AndyPortmen. This native client is a wrapper between your browser and the operating system. Without this wrapper, there is no way to run OS-level commands. Instruction on how to install the native wrapper will be displayed on your first use. The default detected sources only focus on media (video and audio) resources and there is no image detection. How can I extend detectable sources to include images as well? After installing the extension only media sources are considered and the rest of requests are not being monitored. However, if you need the extension to detect image resources as well, you can right-click on the toolbar button and select "Track image resources". By this action, the extension updates its network observer and looks for image sources as well (either image type sources or requests with the "content-type" header that matches an image source). So if you refresh the current page, you will notice the number of detected resources is updating to include image sources as well. By hovering your mouse other the toolbar button, you can get stats of how many resources of each type is detected for the current page. If you click on the toolbar button you will get a new section for images. By default, the image links are not selected in the download manager window as each web page has many image sources. You can still use the "Select all" button located above each category to select the entire items in the category. Just a heads up that image detection may slow down your browser as the number of stored resources for each tab includes all the image sources as well. It is recommended to turn this feature off when it is not needed. You can simply use the right-click menu over the toolbar button to easily enable or disable these resources. I know that all network observers reduce the browser performance. How about this extension and its observer? Well, that's true. When an observer is installed, basically all the network requests are passed through each observer and hence if the observer has high computation module for each network request it can block the page loading and hence affect the browser performance. If you want this extension to have zero effect on your browsing experience, you can uncheck all the observers from the right-click menu and the extension will have no observer at all. Whenever you need to detect a new media, for instance, you can simply right-click over the toolbar and enable the observer. Also, it is recommended to not install the image observer as the number of images on web-pages are just too many and processing these many images are going to have a slight effect on your browser's performance. Note that this extension only installs a single observer that accepts all the above resource types. When a new resource is checked or unchecked, the old observer gets uninstalled and a new one replaces it. Apparently, when none of the resources is selected, there is no observer at all. What is the meaning of the "Interrupt the built-in downloader" item in the right-click menu over the toolbar button? When a site has a downloadable resource but it does not allow you to get the link, check this item and the extension prevents the browser download manager to start getting the file, instead a download dialog similar to the Firefox's download manager pops up and ask you what to do with the recent download. You can either copy the link or download with the internal or an external download manager. My current external download manager is not supported (it is not listed). How can I add it to the list? Well, at the moment there is no option to add a new download manager to the list, however, you can edit the path and arguments for a supported download manager to the ones that fit your external download manager. For instance, select GNU Wget and change the path and arguments to the new download manager and then press the save button. What keywords are supported when sending a download job to an external download manager? [REFERRER]: this is the top level URL or basically the page URL. [PROMPT]: Using this keyword causes the browser to open a prompt window and ask for your input. You can use this for instance to define a name for the local file! How does the extension detect a file-size? Is it going to send a request to the server? No, the extension uses the "Content-Length" header to find the file sizes. If this header is not available, then the size is displayed as "--". You can still use the "Calculate file-sizes" button to send a "HEAD" request and check for "Content-Length" header. Either way, there is no "GET" or "POST" requests as these headers might invalidate your downloading links (some websites only accept a single "GET" or "POST" headers before invalidating the current link). What is the meaning of the color-coded boxes next to the track names? These boxes can be used to limit selection to tracks with the same name. This is particularly useful to select segmented media files. Some websites use segmentation to play tracks which means a single track is split into many segments to provide minimum latency while fetching the media source from the server. This is very useful for playing a media file. To download a segmented media file read the FAQ below! How can I use the renaming tool? First, select all the items you need the renaming tool to act on (you can use the color-coded boxes to select all the matching filenames). The renaming tool is useful to rename all the selected items sequentially. There are two keywords: 1. "[#]" which will be replaced with sequential numbers. You can use "[#=n]" to define the offset (the first item will have the n+1 value). The default offset is zero so the numbering would start from one. 2. "[ext]" This will be replaced with the file extension (last part after the final dot; if there is no dot, the entire filename is considered as the extension). Can I use this extension to download segmented media files? Yes, let the media to be played until it is finished (this is the important part to allow all the segments to be detected), then open the download manager window and scroll down. Now select the color box next to one segment of the track so that all the entire segments are selected. It is also recommended to use the renaming tool to rename sections sequentially (this is helpful to feed the files in the right order to a merging tool). You can use a merging tool to merge all the sections together. I recommend "Media Converter and Muxer" extension by @InBasic. Note that if the page has many media files, you can use the "Clean" item in the right-click context menu to ask the extension to forget the already detected media sources. This is useful to declutter the download manager window!